You got an A+ in shop class right? Good! 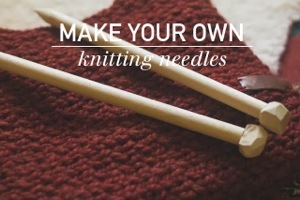 It’s one thing to buy a set of knitting needles for yourself or a loved one. It’s a whole other to fell a tree and hack a few out of the bark with your bare hands! And when you’re done playing Jeremiah Johnson you’ll hit Home Depot and start with a dowel like this clever folks did! They made knitting needles for about $1. Take that Michael’s! And these would make an awesome christmas gift! I’d be tickled if someone took the time to make something for my obsession like this, wouldn’t you? What also blew my mind was thinking of those giant over sized bath rugs and jackets I keep seeing. I could make needles for those projects this way! Or would they be too heavy? I’m going to Home Depot and peruse their dowel assortment. This could be epic! This entry was posted in Uncategorized and tagged christmas gifts, crafts, handmade, homemade, Knitting, knitting needles, wood. Bookmark the permalink. ← Knitting Meets High Fashion! all I keep thinking is….splinters! Especially while making them! But they use steel wool to sand it. It would probably be ok while knitting though. I wonder if there’s a fabric safe sealant you could use?